In a passage seething with erudition and wit, Dog, the antihero of the novel Journey to Virginland, engages in a dialogue of ideas with a sympathetic Catholic priest. 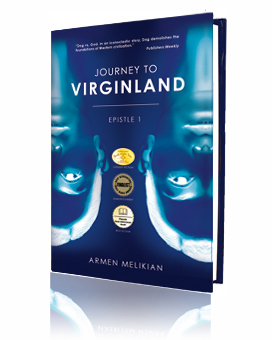 Exhilarating for both its elegant precision and wealth of references, the chapter is a prime example of the philosophical writings of Armen Melikian, the author of Journey to Virginland. A trilogy whose first volume, or Epistle, was published in 2012, it is a novel that takes on the overarching issues of our time, with Melikian’s philosophical writings serving as the building blocks of a richly imagined narrative that takes place in several countries and concerns various epochs of history. Through the storyline, philosophical writings present a passionate, panoramic critique of religion, Christianity in particular, as a key force that may or may not humanize (with the word “humanize” itself eliciting scrutiny), may or may not lead to salvation – or a life well-lived at the minimum. In his philosophical writings, posited strategically throughout the novel, Melikian exposes the myriad tenets and assumptions, including those of religion, that have brought humanity to the complex, interwoven paradigms of hyper consumerism, global capital, and environmental degradation on the one hand, and an ominous resurgence of nationalism and religious extremism on the other. This novel proposes a radically humanistic alternative to our present plight, with Melikian’s philosophical writings providing an eminently sensible rationale for an exuberant vision of change. Looking for original and provoking philosophical writings? Get your copy of Journey to Virginland today!